So I am a normal Type A personality who loves her agendas and all things organization. For the past two years, I've become a Lilly Pulitzer agenda addict. I live and breathe by these babies because they're so colorful, fun and make organization that much more fun. There's not outstandingly special about these agendas; they don't breathe fire or are made from magical unicorn hairs, they're just simple planners. They have monthly views in the front, a few blank note pages and then then the standard planner pages: monthly and at a glance weekly pages. My Lilly Pulitzer agenda was the source of color and fun in my life during the school year but when I graduated, I thought that maybe I should get a plainer planner, something more sophisticated and for the office. I weighed my options but ultimately decided on a Kate Spade planner. I fell in love with them when they were released for the first time last year but had already ordered my Lilly one. This year I decided to take the plunge and order my Kate Spade planner; I decided on the classic stripe planner and waited for it's arrival. 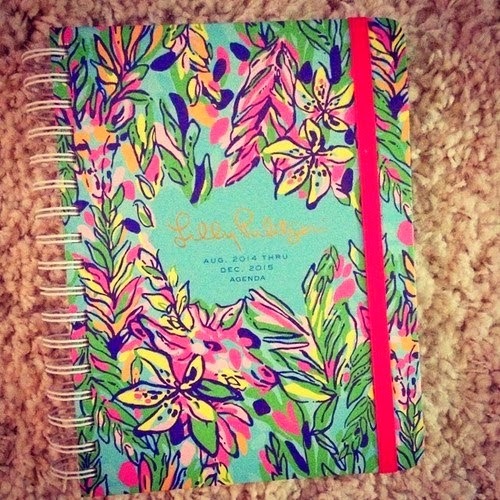 In the meantime, I saw the Lilly agendas being released and was insanely jealous. I wanted to order a small one to have for my blog and because I couldn't just stop my Lilly love cold turkey. That's why I was sort of thrilled/relieved when I got my KS agenda in the mail and hated it. Yes, that's right, I hated it. It was a quite large agenda, a little too big to carry around all day, everyday. It was also very plain inside. Like really plain, old boring. I instantly missed my colorful pages and printed monthly tabs. I was longing for the queen of pink and green. The KS planner is set up the same way as Lilly, the only difference being size and plainness. I did though, like the little quotes at the beginning of each month. It just wasn't enough to satisfy my need of color. There wasn't anything wrong with this Kate Spade planner, though. If the Lilly agendas are too much for you, this might be an answered prayer. I then returned my KS planner and ordered a Lilly one, in the print Hot Spot. My goodness it was nice to be reunited with my colorful pages. The Lilly planners are set up the same way they always are, but there is a more color, more prints and a little more craziness than usual. They definitely upped the ante on these agendas and I love every second of it. I can't wait to start using my new agenda when August comes; it's the best day of the year! Also, aside from these planners, I'll post a review on my Whitney English Day Designer next week. (I received it in my goodie bag from the SGG Conference, read about that here). What are your favorite planners? What did you choose this year? Tell me in the comments! !